I changed a translation from openstreetmap-website on translatewiki 5 days ago. 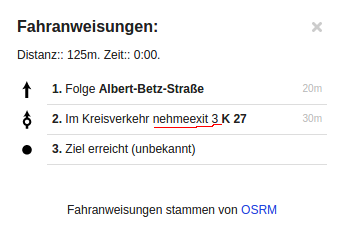 How long does it usually take till this translation is used on osm.org? So currently you can't change this translation. When will translatewiki sync with osm.org? Has anyone experienced how long this in general might take? As far as I have observed on the github repository , the commits from translatewiki.net are triggered manually by user siebrand estimated once or twice in a month. And about the wrong text in routing instructions: it is quite possible that this text is coming from OSRM sourcecode. So dig into that repository on github to get some hints about translations there.